It is the likes of Owusu Bempah that has made the holy bible made it emphatic that by their fruits, we shall know them. 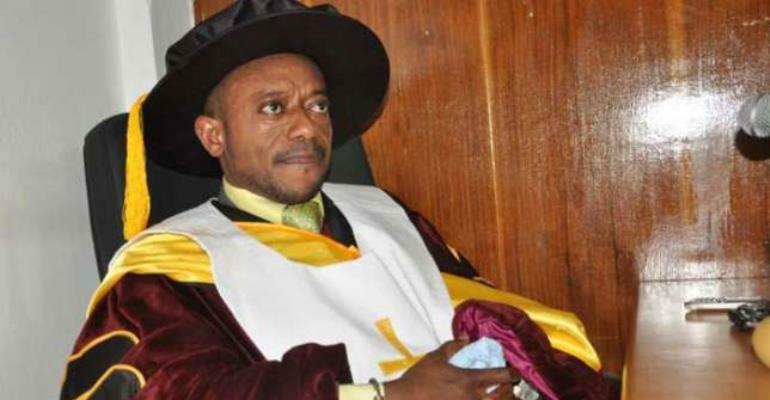 Owusu Bempa can't be classified as a man of God because even his spiritual father Duncan Williams said he never graduated at his feet but rather fled from being mold into fantastic pastors like Eastwood Anaaba, Dag Heward Mills and others. Am not surprised Kwaku Bronsam came out to tell the world Owusu Bempa is fake and he derives his powers from him. Owusu Bempa is evil and must not be tolerated by the Christian Council because he has proven to be making a mockery of God with his nasty, selfish and wicked lifestyle. Owusu Bempa proved to the world on Metro Tv that he is evil when he agreed to the fact that he has twelve parrots in a secret room in his house. When I contacted the spiritualist he said having twelve parrots is a sign of one being initiated into the twelve realms of the satanic kingdom. No wonder the body language of Owusu Bempa on the show showed clearly that he was guilty. Owusu Bempa should know that we are also aware of the money he took from NPP to peddle falsehood against the former President John Dramani MAHAMA. He should know that in that meeting he and Abronye were assigned to constantly attack President John Dramani MAHAMA. No wonder they are executing the terms of the contract to the fullest to please their paymasters. We are aware of the $10million supply contract he was given by the NPP National Secretariat. We are aware of the businessmen he takes money from with the promise of leading them to get contracts from Akufo Addo. We are aware of how the NPP National Secretariat has promised to build an ultra-modern church for him if he is able to carry out his assignments to perfection. We are aware of why he can't stop bleaching his skin because it is a spiritual direction from the source of his powers. Owusu Bempa should know that we are aware of his secret meetings with the invisible forces in the NPP who he calls his macho men and how they have planned evil again the NDC. But in all these, I wish to tell the man called Owusu Bempa that God Almighty is Supreme and he will continue to be supreme. We wish to remind him that he is not God and his time of noise making has come to an end. Because his downfall is very close to him. The Bible said pride cometh before destruction and his pride has led him very close to the destruction he has brought onto himself. Owusu Bempa should Remember that the God of John Dramani MAHAMA and the NDC is not asleep and is working for us every minute. Owusu Bempa should be reminded that anyone who stands against the NDC and John MAHAMA falls into an everlasting bottomless pit of destruction. He should remember the likes of Bugri Naabu, Otiko Djaba, Hon. Agyarko and the rest. We have men of God like Arch Bishop Duncan Williams, Dr. Otabil, Prophet Badu Kobi, Bishop Dag Heward Mills and others who behave like pastors and not political animals because of $10million contract from NPP. Owusu Bempa is truly a disgrace to the Christendom. I am a Christian and am ashamed anytime I hear people call him a prophet. He should know that we will not kowtow to a "man of God" who gives prophecy and afterward apologize on behalf of God who revealed the prophecy to him. I wish to remind him once again that he Owusu Bempa is not the decider of who becomes the next President of Ghana but God does. He should note that God is very angry with him and he should repent before he is struck dead by God with thunderstorms! Thanks to President John MAHAMA for letting Owusu Bempa know that God doesn't even know him as a church member not to talk of being a prophet. Wish to encourage my fellow NDC members that they should never be afraid of the man called Owusu Bempa because the powers of God is supreme and Victory will be ours come 2020. B/A REGIONAL YOUTH ORGANIZER, NDC.